We wish to acknowledge a generous donation from Mr. Philip Doddridge, past president of The Hong Kong Veteran's Association. 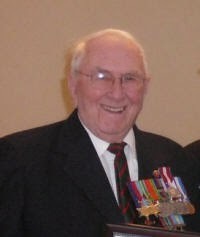 Mr. Doddridge is regarded as an esteemed friend of the Gander Heritage Memorial Park and, in particular, Sergeant Gander. 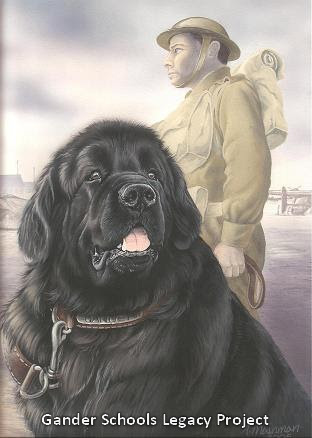 He was stationed in Gander in 1941 with the Royal Rifles of Canada when "Pal" was adopted as their mascot. He was present when "Sergeant Gander" was posthumously awarded the "Dickin" medal and took part in the ceremony which was held at the Canadian War Museum in Ottawa in 2000. Also, interesting to note that Mr. Doddridge was on duty in the Control Tower at Gander the night [February 21, 1941] that Sir Frederick Banting's fatal flight took off from Gander for England. Our sincere thanks to the Newfoundland and Labrador Women's Institute Gander Branch for their purchase of a Paving Stone for the Park. Committee Member Pat Brazil attended the luncheon in commemoration of their 80th Anniversary on February 16th 2015 and gratefully accepted their donation. We now have an updated Donations page and an updated Donations Progress Bar with an updated Ticker on the right. As of February 16 2015 we have achieved 82.8% of our target which amounts to $446,988 of our target total of $540,000. Thank you to all who have donated your time or financial aid ... much appreciated! On the Donations page I updated sections Individual Donors and Plaza Stones Purchases!